eXo Platform is an award-winning online collaboration software. eXo Platform is an excellent open source social networking solution that is also built as a collaboration tool that users will find very smart. The platform flaunts an intuitive interface that is very “social” in design and easy to use as well. With eXo, you can comment on posts, upload and share docs, create groups, and much more. A detailed review of eXo Platform prepared by our experts is also available with a thorough analysis of eXo capabilities and features. What makes eXo Platform a prime tool for collaboration is its design as a social application. It is built as a social platform and is integrated with social tools that make work and work-related processes, such as document management, community building, etc, easy and fast. As many businesses and organizations and even individuals are now using social platforms for their professional and personal relationships, actions, and decisions, it is only natural that an enterprise social application such as the eXo Platform becomes more and more useful in helping businesses achieve their goals and meet their standards. eXo offers excellent document management with central storage which helps teams to access shared files easily. You can categorize the documents based on your sorting rules for quick retrieval. The search feature includes non-document files such as posts, tasks, and events. This helps you quickly pull out a post or past comment that is relevant to a document. The Lifecycle Management feature ensures all your team members are working on the latest document version. You can set custom access rules to ensure only authorized employees access sensitive data. You can build an internal knowledge base featuring FAQs, forums, and wikis. eXo can also be used a CMS (Content Management System) for complex websites, intranets, and extranets by extending templates. Collaboration is important in today’s business scenario, and eXo Platform helps you create a company social intranet for better team play and sharing. All your business units can collaborate to achieve common goals. At the same time, individual users can have their own customizable personal dashboard that can be installed with gadgets to track analytics, status, feeds, and metrics. eXo offers a collaborative workspace named Spaces within which users can switch between tools like video calls, chats, forums, and wikis. Spaces can be used as a conference room where employees can share thoughts and feedback. There is also the flexibility to make Spaces open or closed, private or public, or a subgroup of a larger project, managed by your administrators. You can track company updates through workspaces, social networking, and activity streams. Exo also offers shared calendars which help managers connect a regular work pipeline between teams without the need for a supervisor. eXo provides a flexible open source platform that can be adapted to any company setup. Plus, you can also integrate eXo with external apps such as BonitaSoft’s Open Solution to provide added flexibility in creating customized business process management (BPM). But, you need IT help to manage the processes and display form-based apps generated by an embedded Bonita User Experience console. It is advisable not to over-extend an open source framework like eXo to avoid stability issues, but with good programming talent, you can make your BPM more effective. Customers can use Exo’s community management system to share their experiences and provide feedback using multiple channels. You can use the web CMS tool to create product spaces on your website such as building a fan base around your product. Customers can use this space to post their reviews, upload images, and discuss relevant issues. You can also offer a knowledge base for self help, forums, polls etc. to convert customers into brand advocates. Plus, you can use eXo’s social platform to build marketing and support channels. 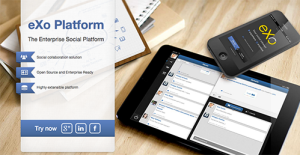 eXo Platform offers native iOS and Android apps to help take the social intranet on the road. The mobile extension is a comprehensive version of the open source platform. You can use the newsfeed to track your team’s activities and get real-time updates. You can also access documents and additional gadgets and apps in the mobile app, and synchronize user permissions across the platform. How Much Does eXo Platform Cost? What Problems Will eXo Platform Solve? 1. Social Intranet: Companies willing to improve internal communication, employee productivity, satisfaction and engagement can use eXo as a social intranet. Connect with colleagues, and find experts in the directory based on their skills and interests. Create project spaces for cross-departmental initiatives. Capture expert knowledge with forums and wikis. Hear the unheards with an open conversation model promoted by activity streams. 2. Social Extranet: Companies willing to improve customer satisfaction, or partners engagement can build a social extranet with eXo. Build a searchable knowledge base with the wiki, support customers with forums, provide private spaces for your partners or customers for discrete collaboration or open spaces for communities of interest. 3. Website: Companies that need to have an easy tool for publishing websites can use eXo Platform. With its built-in web content management features, and ready-to-use templates, eXo Platform lets you build and publish websites. Content is easy to edit thanks to the inline edit feature. Since each organization has unique business wants, it is advisable for them to abstain from seeking a one-size-fits-all perfect software solution. Needless to say, it would be useless to try to find such a platform even among widely used software solutions. The smart thing to do would be to jot down the various essential elements that require consideration such as required features, budget, skill levels of workers, company size etc. Then, you should do your research thoroughly. Read some eXo Platform reviews and check out each of the other apps in your shortlist in detail. Such in-depth groundwork can make certain you discard ill-fitting applications and choose the solution that offers all the features you require for business success. We realize that when you make a decision to buy Collaboration Software it’s important not only to see how experts evaluate it in their reviews, but also to find out if the real people and companies that buy it are actually satisfied with the product. That’s why we’ve created our behavior-based Customer Satisfaction Algorithm™ that gathers customer reviews, comments and eXo Platform reviews across a wide range of social media sites. The data is then presented in an easy to digest form showing how many people had positive and negative experience with eXo Platform. With that information at hand you should be equipped to make an informed buying decision that you won’t regret. What are eXo Platform pricing details? What integrations are available for eXo Platform? Pros: I love how friendly eXo Platform's interface is and how it encourages social collaboration within the organization. Communication is extremely simplified, making collaborative efforts seamless and very productive. Cons: There is nothing I dislike about eXo. It is so user-friendly and comes loaded with awesome features that makes collaboration fast, easy, and productive. Pros: eXo platform is good for intuitive setup and usage, the layout is social friendly and easy to understand without much training. Cons: The layout is a bit dull, but it could be improved easily by CSS customization. eXo Platform features a very large and supportive community. I love the simple yet powerful way to handles various aspects of project management. eXo platform is good for intuitive setup and usage, the layout is social friendly and easy to understand without much training. eXo Platform is very user-friendly and straightforward, enabling you to focus on other impending and critical issues. Awesome platform with great features. Love the community edition and great for development work or project management. Cons: It can get expensive but that’s why you have enterprise pricing of $1200 which is reasonable. If you need more information about eXo Platform or you simply have a question let us know what you need and we’ll forward your request directly to the vendor.